Tens of thousands of Hungarians have protested in Budapest against what they say is the unfair election system that gave Viktor Orban a landslide victory at the polls after a "hate campaign" against immigrants. Saturday's protest came after the prime minister won a third straight term in power in Sunday's elections. Orban's ruling Fidesz party secured a majority in parliament, giving him two-thirds of seats based on preliminary results. In a Facebook post before the rally, organisers called for a recount of ballots, free media, a new election law, as well as more efficient cooperation among opposition parties instead of the bickering seen in the run-up to the vote. 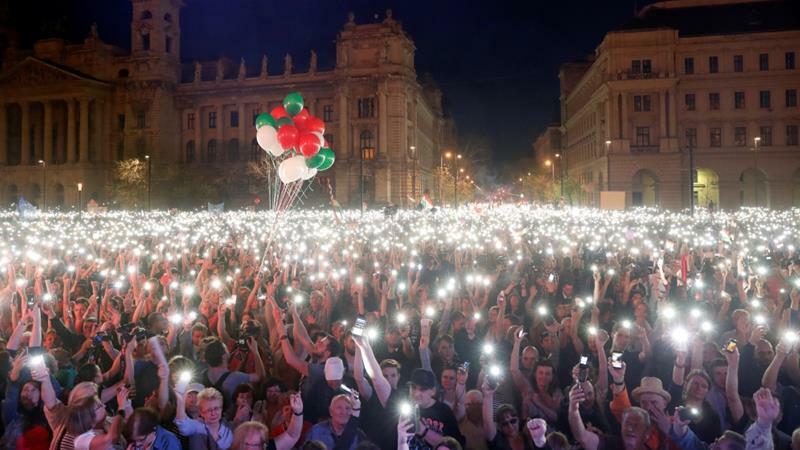 The protest was among the biggest in Hungary in recent years, similar in size to a mass rally prompted by Orban's plan to tax internet use four years ago and a pro-government demonstration called by Orban supporters shortly before the election. Fidesz received 49 percent of national party list votes and its candidates won 91 of 106 single-member constituencies, most of them in rural areas. Leftist opposition candidates carried two-thirds of the voting districts in Budapest. There was a similar split between ages, with support for Orban's Fidesz at 37 percent among voters below 30, rising gradually to 46 percent among those older than 50, according to a survey by think-tank Median published earlier this week. The Organisation for Security and Cooperation in Europe (OSCE) has said the election did not offer opposition parties a level playing field amid a host of problems marring a vote that nonetheless generally respected fundamental rights. In their Facebook post, the rally's organisers said: "Fidesz's election system and the government's hate campaign have pushed the majority into a one-third (parliamentary) minority." Protesters marched from the Opera House, a 19th century Neo-Renaissance palace on a majestic downtown avenue, to Parliament by the Danube River, waving Hungary's tricolour flag and the European Union flag, accompanied by whistles and horns blaring. As demonstrators filled a large square outside Parliament, many were still walking on main roads leading there, chanting: "We are the majority." Organisers of the event estimated the size of the crowd at over 100,000 people, which briefly took on a festival-like atmosphere as a pop singer took the stage to perform an opening song blasting Orban's "pseudocracy". In the election campaign Orban projected himself as the defender of Hungary's Christian culture against Muslim migration into Europe, an image which resonated with millions of voters, especially in rural areas. But the opposition's poor showing was at least partly of its own making as rival candidates split the anti-government vote in five districts in Budapest, where preliminary results showed a slim Fidesz victory.